“I grew up in refugee camps for thirty years, I experienced injustices of every kind. What was always at back of my mind was that we could not continue to live this kind of life. We had to sort it out, there is no one else who was going to sort it out for us. We were reduced to the kind of level where you had to give everything you had, including possibility to lose your life to be able to regain it. The driving factor in my mind was to try to do what is right. Our vision was to bring together the people of the country, for them to value each other and work with each other for their country.” – Paul Kagame (March 2018). In 1994 Paul Kagame was the leader of the Tutsi rebels, he and so many Rwandans believed in international organisations and the West, they pleaded with the world to stop the Rwandan genocide. “All along we thought that’s why they were here,” Kagame speaks to CNN, referring to the U.N. troops sent to monitor a peace agreement between the minority Tutsis and ruling Hutus. But the nations of the world, he said, turned a deaf ear and a blind eye. In the late 1950s and early ’60s, Kagame’s family and other Tutsis were under siege as Hutu gangs went from village to village, pillaging and killing. The Kagames, including 3-year-old Paul, fled to Uganda. Born in Gitarama Prefecture, Rwanda, on October 23, 1957, Kagame was the youngest of a Tutsi family of four sisters and one other brother. His father was from a privileged Tutsi background drawing on familial relations with King Rudahigwa of Rwanda, and his mother was intimately related to the King’s wife. 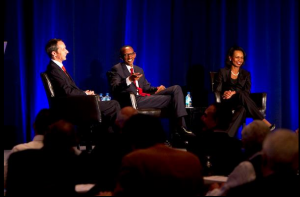 Despite these elite connections the Kagame family was forced to flee Rwanda two years after Paul’s birth in the face of ethnically framed violence by Hutu extremists. This very early experience of life on the move would go on to typify much of Kagame’s life until mid-1994. The chaos of displacement also meant that Kagame was separated from his siblings for most of his early life as two of his sisters left the country to eventually settle in Italy, while his brother died in a car accident. After spending some time in the Democratic Republic of Congo (former Zaire) and Burundi, the family’s attempt to settle in Rwanda was stifled by the vagaries of political sectarianism and violence. In search of security and a semblance of normality, Kagame’s parents took him in 1960 to Uganda, where they made their long-term home in the Toro district of the Nshungerezi refugee camp. Paul Kagame spent the next three decades as a refugee. During that time he rose through the ranks to become a senior officer in the Ugandan army. All the while, he and other refugees longed to return home to Rwanda. In 1990, Kagame was attending a training course at Fort Leavenworth in the U.S. state of Kansas when Tutsi rebels invaded Rwanda. After some initial success, the rebel forces were forced to retreat. Among the casualties was their leader, who had been killed on the second day of the attack. When news of the failed invasion reached Kagame, he left the United States, resigned from the Ugandan military and took command of the Tutsi rebel militia. Kagame instilled strict discipline in his growing rebel army. They would launch successful attacks that eventually brought the ruling Hutu government to sign a power-sharing agreement in 1993 known as the Arusha Accords. But the peace agreement was a façade. Hutu extremists had no intention of sharing control of the Rwandan government. And in April 1994, they began their attempt to exterminate the Tutsi population. Kagame’s forces resumed their attacks, desperate to save their fellow Tutsis. The Hutu government had far more troops, but Kagame’s soldiers had far more discipline. In battle after battle, they were victorious, gaining control of more and more of Rwanda, ultimately declaring victory in July 1994 — but not before more than 800,000 were dead. As president, Kagame has prioritized national development, launching a programme to develop Rwanda as a middle income country by 2020 (Vision 2020). As of 2013, the country is developing strongly on key indicators, including health care and education; annual growth between 2004 and 2010 averaged 8% per year. 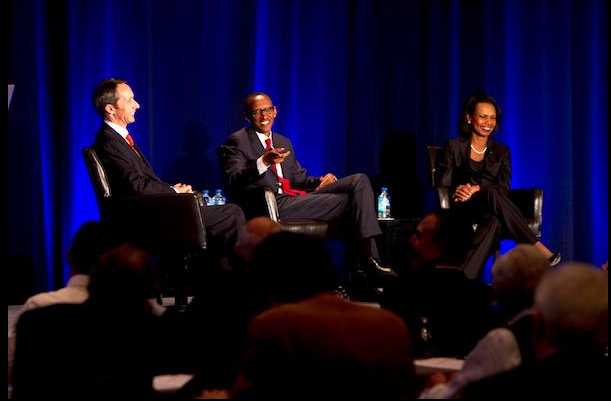 Kagame has had mostly good relations with the East African Community and the United States; his relations with France were poor until 2009. Relations with the DRC remain tense despite the 2003 ceasefire; human rights groups and a leaked United Nations report allege Rwandan support for two insurgencies in the country, a charge Kagame denies. Several countries suspended aid payments in 2012 following these allegations. Kagame is popular in Rwanda and with some foreign observers; human rights groups accuse him of political repression. He won an election in 2003, under a new constitution adopted that year, and was elected for a second term in 2010. Kagame was elected again in 2017, and due to yet another change in the constitution, he could potentially be President until 2034. 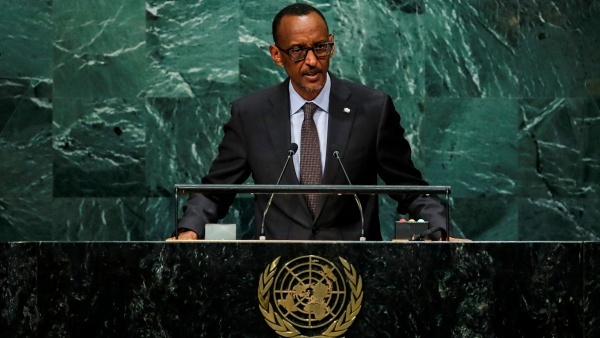 In 2018, Kagame began a one-year term as Chairperson of the African Union. President Paul Kagame says that during his tenure as Chairperson of the African Union, among the action items he will seek to advance include gender inclusion and equity at the Union.